Jeanne Rose is one of America's best known herbalists and "Kitchen Cosmetics "is her most intimate guide to natural health and beauty. Over 100 of Jeanne's favorite recipes and tips provide safe and simple applications created by Jeanne for her own family's needs. Based on common kitchen and garden ingredients - from yogurt to berries to rosemary - these lotions, creams, and other moisturizers, masks, teas, toothpastes, deodorants, shampoos, and conditioners are easily prepared in the home. 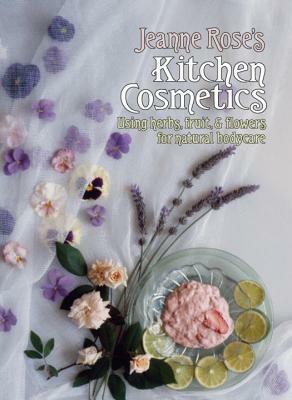 Shopping suggestions, herbal cosmetic techniques for the whole body, and fascinating herbal lore make "Kitchen Cosmetic"s a valuable and charming guide to natural beauty and health care. Since its publication in 1978, " Kitchen Cosmetics" has become the leading title in home preparation of natural cosmetics. It is used by apartment dwellers who buy herbs, gardeners who tend a few pots in sunny windows, and gardeners with spacious beds...a steadily growing number of people who want to 'take back' the pleasure of working with herbs themselves - and want more control over what the put on their hair, face, and body.